A fundamental step in addressing the global problem of mycotoxins is the development of highly sensitive, multi-class extraction and detection methods. This constitutes a field of research that has in recent years enjoyed a steady advance. Such methods, generally based on liquid chromatography coupled to mass spectrometry, are widely reported successfully detecting various mycotoxins in different food and feed samples. In this work, an innovative approach to multi-class mycotoxin control is proposed, offering specific advantages: a broader inclusion of more mycotoxin classes, robust and thorough extraction for all target compounds despite their varied chemical properties, and determination of all analytes from a single injection. The method involved the extraction and quantification of the main mycotoxins produced by Aspergillus, Fusarium, and Penicillium fungi, as well as their reported derivatives, together with 12 other compounds most commonly produced by Claviceps purpurea. The popularly reported QuEChERS technique has been reduced to a simple “salting-out liquid-liquid extraction” (SO-LLE) to obtain the most efficient extraction of the aforementioned mycotoxin classes in a very short time. This is in particular extremely important in ensuring correct determination of individual ergot alkaloids, for which short and robust sample preparation as well as short analytical sequences were key for minimizing the epimerization during analysis. The analyses of wheat and maize samples were performed using ultra-high performance liquid chromatography coupled with tandem mass spectrometry. Matrix-matched calibration curves were established and limits of quantification were below the maximum levels established by the EU regulation. The precision (repeatability and intermediate precision) was lower than 13% in all cases and recoveries ranged between 60 and 98% in maize and between 62 and 103% in wheat, fulfilling the current legislation. The method was applied to study the co-occurrence of these mycotoxins in wheat (n = 13) and maize (n = 15) samples from six European countries. A successful quantification of 23 different mycotoxins, from all major classes, in 85% of wheat and 93% of maize samples was achieved. In the context of human and veterinary drugs identification, ion mobility spectrometry (IMS) in combination with mass spectrometry (MS) may provide a relevant complementary piece of information to mass-to-charge ratio (m/z), the so-called collision-cross-section (CCS). Up to now, however, the application of CCS as identification parameter has not been fully investigated due to the reduced number of these drugs that have being characterized in terms of CCS. This work proposes a CCS database for 92 human and veterinary drugs, including eighteen benzimidazoles, eleven 5-nitroimidazoles, eleven aminoglycosides, nineteen quinolones, eighteen β-lactams, ten sulfonamides and five tetracyclines. Among them, 37 drugs have been characterized in terms of CCS for the first time. The CCS values of the other 55 compounds have been compared with those from a recently published database in order to evaluate inter-laboratory reproducibility, which is crucial for the implementation of the CCS as identification parameter. CCS values were measured by traveling wave ion mobility spectrometry (TWIMS) under positive ionization conditions. Nitrogen was used as drift gas in the ion mobility cell. The proposed database covers 173 ions including [M+H]+ and [M+Na]+ species. High correlation between m/z and CCS has been observed for [M+H]+ (R2 = 0.9518, n = 91) and [M+Na]+ (R2 = 0.9135, n = 82) ions. As expected, CCS values for sodium adducts are generally greater than for protonated molecules because they exhibit higher molecular weight. However, sodium adducts of aminoglycosides, β-lactams, and of several quinolones and benzimidazoles, were characterized as more compact ions than their related protonated molecule. In addition, this work describes the fragmentation pattern observed for the studied molecules. For the first time, the main fragment ions for most of the compounds have also been characterized in terms of CCS, involving a total of 238 ions. 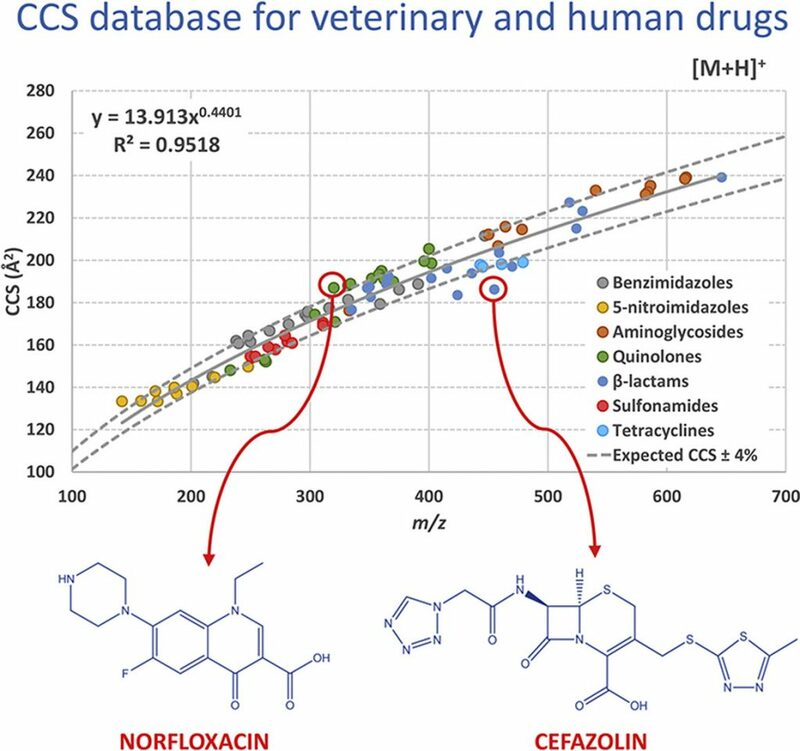 As proof of concept, for the application of this database to biological matrices, eleven veterinary drugs in bovine urine samples were characterized in terms of CCS, showing that this parameter was not influenced by the matrix. The presence of Aspergillus section Flavi and aflatoxin (AF) contamination was investigated in 112 samples of peanuts, almonds and dried figs collected in Algeria. The occurrence of aflatoxin B1 (AFB1), B2 (AFB2), G1 (AFG1) and G2 (AFG2) in different commodities has been determined with a sensitive method based on high performance liquid chromatography (HPLC) coupled with fluorescence detection with post-column photochemical derivatisation. Analytical results indicated that 28 samples of peanuts, 16 samples of almonds and 26 samples of dried figs contained detectable levels of AFs. A total of 69 samples (61.6%) were contaminated with AFB1 ranging from the limit of quantification to 174 µg kg−1. AFB2 was found in 12 samples (10.7%) and varied from 0.18 to 193 µg kg−1. Seven samples revealed AF concentrations lower than the limit of quantification. Eleven peanut and fourteen dried fig samples exceeded the European maximum limits for AFB1. QuEChERS (Quick, Easy, Cheap, Effective, Rugged and Safe) methodology in combination with UHPLC–MS/MS is proposed for the determination of 5-nitroimidazole (5-NDZ) residues in infant milk-based products. Chromatographic separation was accomplished in a C18 Zorbax Eclipse Plus RRHD (50 × 2.1 mm, 1.8 μm) column under gradient elution conditions. Mobile phase consisted of 0.025% (v/v) aqueous formic acid (eluent A) and MeOH (eluent B), and was supplied at a flow rate of 0.5 mL/min. Under these conditions, eleven 5-NDZs including three metabolites were separated in less than 4 min. A novel QuEChERS method was optimized, and primary-secondary amine (PSA) sorbent was selected as clean-up agent. In addition, the proposed QuEChERS procedure was compared with other sample preparation methodologies, which are usually used in the analysis of 5-NDZs, namely solid phase extraction (SPE) using mixed cation exchange (MCX) cartridges and molecularly imprinted solid phase extraction (MISPE). Method comparison was carried out in terms of process efficiency, which includes matrix effect and extraction recovery. Higher process efficiency was generally achieved for QuEChERS and MISPE than for SPE. However, matrix effect was more significant for the non-selective QuEChERS method than for the selective MISPE. Higher extraction recoveries (63.2–94.1%) were observed for QuEChERS. The studied methods were validated in terms of linearity, detection limits (CCα), detection capabilities (CCβ) and precision, observing similar performance characteristics independently of the proposed sample treatment. CCα and CCβ ranged between 0.05 and 1.69 μg/L for all analytes and extraction techniques. QuEChERS-UHPLC–MS/MS method was also validated in terms of precision (relative standard deviations <10.3%), trueness (recovery>70.2%) and selectivity according to Regulation 2002/657/EC. It is proposed as a good alternative for the monitoring of 5-NDZ residues in enriched infant-milk based products and other similar milk based-products. A green and simple multiresidue method using capillary liquid chromatography (CLC) with UV-diode array detection (DAD) has been developed for the determination of sixteen benzimidazoles (BZs) and its metabolites in milk samples. The separation was achieved in <32 min, using a Zorbax XDB-C18 column (150 mm × 0.5 mm I.D, 5 μm), with a mobile phase consisting of 50 mM ammonium acetate (solvent A) and a mixture of acetonitrile/methanol (1:1 v/v) (solvent B), at a flow rate of 9 μL min−1. The temperature of the column was 20 °C and 6 μL of sample were injected. In spite of the complexity of milk samples, an effective, simple and fast sample preparation method called salting out-assisted liquid-liquid extraction (SALLE) was developed for the analysis of these compounds in cow milk samples. To obtain satisfactory extraction efficiencies for the studied analytes, several parameters affecting the SALLE procedure were optimized including the amount of sample, type and volume of the extraction solvent, and the nature and amount of the salt. Good linearity was obtained (R2 > 0.9985 for all BZs) with limits of detection (LOD) between 1.0 and 2.8 μg kg−1. Relative standard deviations of repeatability and intermediate precision were below 1.6 and 14.2%, respectively. Satisfactory recoveries between 79.1 and 99.6% were also obtained for three types of milk samples (cow, sheep and goat). The advantages of a miniaturized technique such as CLC in terms of better efficiencies and reduced solvent consumption, combined with the simplicity of the SALLE procedure, make this method a useful alternative for the monitoring of these residues at trace level. Collision cross section (CCS) database: an additional measure to characterize steroids. Ion mobility spectrometry enhances the performance characteristics of liquid chromatography–mass spectrometry workflows intended to steroid profiling by providing a new separation dimension and a novel characterization parameter, the so-called collision cross section (CCS). This work proposes the first CCS database for 300 steroids (i.e., endogenous, including phase I and phase II metabolites, and exogenous synthetic compounds), which involves 1080 ions and covers the CCS of 127 androgens, 84 estrogens, 50 corticosteroids, and 39 progestagens. This large database provides information related to all the ionized species identified for each steroid in positive electrospray ionization mode as well as for estrogens in negative ionization mode. CCS values have been measured using nitrogen as drift gas in the ion mobility cell. Generally, direct correlation exists between mass-to-charge ratio (m/z) and CCS because both are related parameters. However, several steroids mainly steroid glucuronides and steroid esters have been characterized as more compact or elongated molecules than expected. In such cases, CCS results in additional relevant information to retention time and mass spectral data for the identification of steroids. Moreover, several isomeric steroid pairs (e.g., 5β-androstane-3,17-dione and 5α-androstane-3,17-dione) have been separated based on their CCS differences. These results indicate that adding the CCS to databases in analytical workflows increases selectivity, thus improving the confidence in steroids analysis. Consequences in terms of identification and quantification are discussed. Quality criteria and a construction of an interlaboratory reproducibility approach are also reported for the obtained CCS values. The CCS database described here is made publicly available. Posted in Ion mobility, Steroids	| Tagged MS	| Comments Off on Collision cross section (CCS) database: an additional measure to characterize steroids. Optimization of a modified QuEChERS method for the determination of tetracyclines in fish muscle by UHPLC–MS/MS. In this work a sample treatment based on a modified QuEChERS method combined with ultra-high-performance liquid chromatography–tandem mass spectrometry (UHPLC–MS/MS) was proposed to determine the residues of five common tetracyclines in fish muscle samples. The separation was achieved in less than 4 min and the analytes were detected in electrospray ionization in positive mode (ESI+) with multiple reaction monitoring mode. Parameters affecting the extraction step, such as the amount of sample and EDTA-McIlvaine buffer and extraction solvent volumes, were optimized by means of experimental design. In order to obtain the lowest matrix effect, parameters affecting the clean-up step by dispersive solid phase extraction (dSPE), were also studied. Under optimum conditions, matrix effect was lower than │15│% in all cases. Limits of quantification were lower than 4.4 μg kg−1 for the compounds in the selected samples, being in compliance with the current legislation. The precision, expressed as relative standard deviation, was below 18.5% and the recoveries for fortified fish samples (salmon and panga) higher than 80%. These results revealed that the proposed method is simple, rapid, cheap and environmentally friendly, being successfully applicable for the determination of these residues in fish samples. Posted in Mass spectrometry, Panga, QuEChERS, Salmon, Tetracyclines, UHPLC	| Tagged MS, QuEChERS, UHPLC	| Comments Off on Optimization of a modified QuEChERS method for the determination of tetracyclines in fish muscle by UHPLC–MS/MS. Ultra-high performance liquid chromatography (UHPLC) coupled with fluorescence detection (FL) has been proposed for the first time to determine thirteen benzimidazoles (BZs) in farmed fish samples. In order to optimize the chromatographic separation, parameters such as mobile phase composition and flow rate were carefully studied, establishing a gradient mode with a mobile phase consisted of water (solvent A) and acetonitrile (solvent B) at a flow rate of 0.4 mL/min. The separation was performed on a Zorbax Eclipse Plus RRHD C18 column (50 × 2.1 mm, 1.8 μm), involving a total analysis time lower than 12 min. Salting-out assisted liquid-liquid extraction (SALLE) was applied as sample treatment to different types of farmed fish (trout, sea bream and sea bass). To obtain satisfactory extraction efficiencies for the studied analytes, several parameters affecting the SALLE procedure were optimized including the amount of sample, type and volume of the extraction solvent, and the nature and amount of the salt used. Characterization of the method in terms of performance characteristics was carried out, obtaining satisfactory results for the linearity (R2 ≥ 0.997), repeatability (RSD ≤ 6.1%), reproducibility (RSD ≤ 10.8%) and recoveries (R ≥ 79%; RSD ≤ 7.8%). Detection limits between 0.04–29.9 μg kg−1 were obtained, demonstrating the applicability of this fast, simple and environmentally friendly method. Simple and rapid determination of 5-nitroimidazoles and metabolites in fish roe samples by salting-out assisted liquid-liquid extraction and UHPLC-MS/MS. A novel multiresidue method is proposed for the determination of 12 5-nitroimidazoles and their metabolites in fish roe samples using UHPLC-MS/MS. A salting-out assisted liquid-liquid extraction procedure was performed prior to sample analysis. The separation of compounds was accomplished using a C18 Zorbax Eclipse Plus column (50 mm × 2.1 mm, 1.8 µm) at 25 °C and a mobile phase consisting of 0.025% (v/v) aqueous formic acid and pure MeOH at a flow rate of 0.5 mL/min. Parameters involved in ionization and fragmentation were also optimized. The method was characterized in terms of linearity (R2 ≥ 0.9992), extraction efficiency (≥68.9%), repeatability (RSD ≤ 9.8%), reproducibility (RSD ≤ 13.9%) and trueness (recoveries ≥81.4%). Decision limits (CCα) and detection capabilities (CCβ) were obtained in the ranges 0.1–1.0 and 0.2–1.7 µg/kg, respectively. Posted in 5-nitroimidazoles, Fish roe, Mass spectrometry, P12-AGR-1647, SALLE, UHPLC	| Tagged MS, SALLE, UHPLC	| Comments Off on Simple and rapid determination of 5-nitroimidazoles and metabolites in fish roe samples by salting-out assisted liquid-liquid extraction and UHPLC-MS/MS. Determination of tetracyclines in human urine samples by capillary electrophoresis in combination with field amplified sample injection. A sensitive method using CZE‐UV detection has been developed for the determination of five tetracycline antibiotics in human urine samples. To improve the sensitivity of the method, an on‐line preconcentration strategy, named field‐amplified sample injection, has been developed, based on the electrokinetic injection of the sample, which requires only a 1:100 dilution with sample solvent before injection. Under optimum conditions, sensitivity enhancement factors ranged from 450 to 800 for the studied compounds. The applicability of the proposed method was demonstrated by the determination of these antibiotics in spiked urine samples. The limits of quantification were lower than 0.8 mg/L and the precision (intra‐ and inter‐day), expressed as %RSD was below 14%. Recoveries ranged from 92.1 to 96.7%. Thus, the proposed procedure is a simple, fast and efficient strategy which could be used as therapeutic drug monitoring in human urine samples. Posted in CZE, Dilute and shoot, FASI, P12-AGR-1647, Tetracyclines, UV-vis, Urine	| Tagged CE, UV-Vis	| Comments Off on Determination of tetracyclines in human urine samples by capillary electrophoresis in combination with field amplified sample injection.